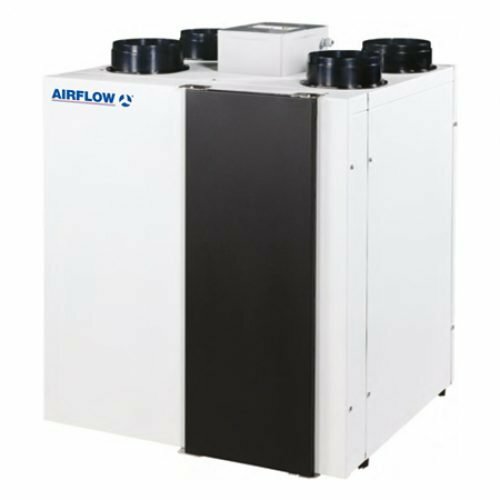 With its powerful air volume capacity and high thermal efficiency the DV110 Adroit is suitable for medium sized family homes. Control your indoor air environment at home or on the go via the Adroit ‘Cloud’ internet control by smart phone, tablet or PC. 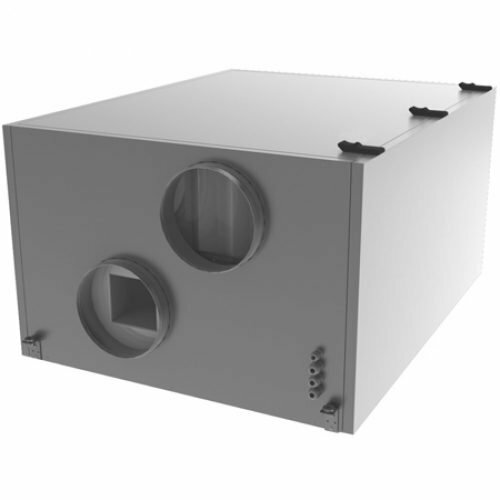 DV110 Adroit is a ventilation unit with state-of-the-art technology suitable for medium sized houses up to 170 m2. 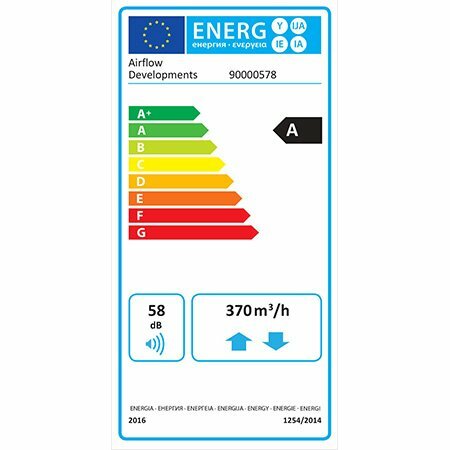 Designed to provide essential ventilation and to save you money through its intelligent heat recovery facility, this system provides a cost-effective and environmentally friendly option for residential applications. Having the latest, low energy EC fan technology, the DV110 Adroit complies with the ErP 2016 and the proposed ErP 2018 standards. The unit comes with an outstanding 5 years warranty*, is SAP Appendix Q eligible. SAP Appendix Q eligible. Meets building regulations. 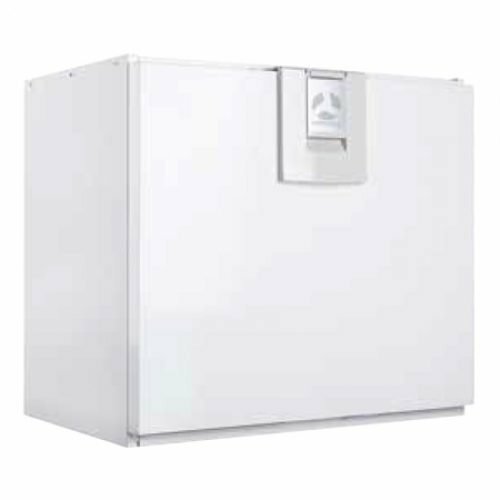 The DV110 Adroit includes an easily removable, plastic heat exchanger which transfers warmth from the outgoing waste airstream into the incoming fresh air with thermal efficiency up to 90%. At no point do the airstreams mix. 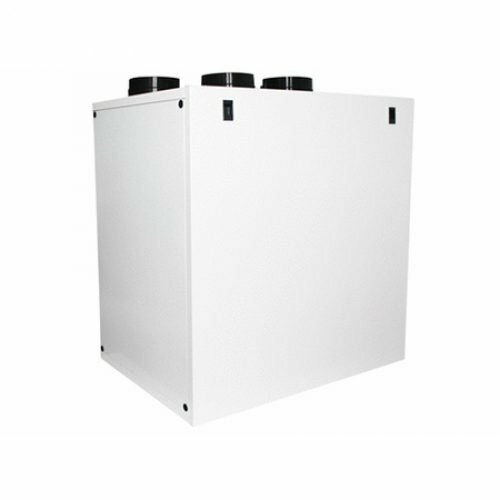 The DV110 Adroit is designed with a unique triple filter facility including a F7 pollen filter which provides additional protection against invisible, harmful particles and creates an ultra hygienic environment, particularly relevant for those suffering from asthma or other respiratory conditions. An optional digital controller with LCD display which incorporates four independent environmental profiles, weekly ventilation programming, and full internet control at home or on the go with the Adroit ‘Cloud’, separate fan control for easy commissioning and the optional smart frost protection facility which significantly reduces the energy consumed to protect the heat exchanger from freezing. When fitted with an optional electric post-heater, the unit keeps the indoor air temperature at the required level hence saves on heating bills especially during the winter period. It is also equipped with an automatic, 100% bypass facility which fully covers the heat exchanger at the pre-defined temperature and helps to effectively maintain a temperate indoor air climate during the summer months. 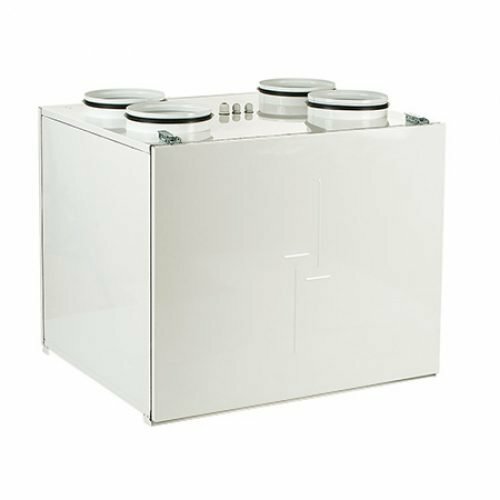 The DV110 Adroit is made of a galvanised steel housing unit which is powder coated both internally and externally to ensure high durability and meet the hygiene requirements. The robust double-skin casing includes 20mm insulation, this avoids any thermal bridging which minimises condensate build-up in the unit and significantly absorbs the fan noise. Also an auto cut-out switch is available which immediately cuts the power off as soon as the front cover is removed providing full safety for the user. 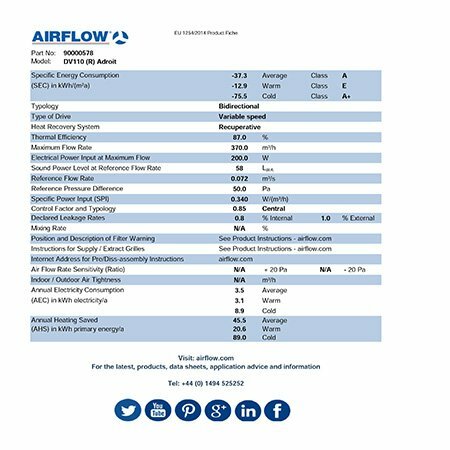 In addition to a choice of compatible ducting systems a full range of sensors, in-line silencers, floor/wall/ceiling inlet and outlet diffusers are available to complete the installation.